While filling out waybills for cars heading west via various connections with the CWE, it became apparent that there was a real dearth of western road cars on the railroad. 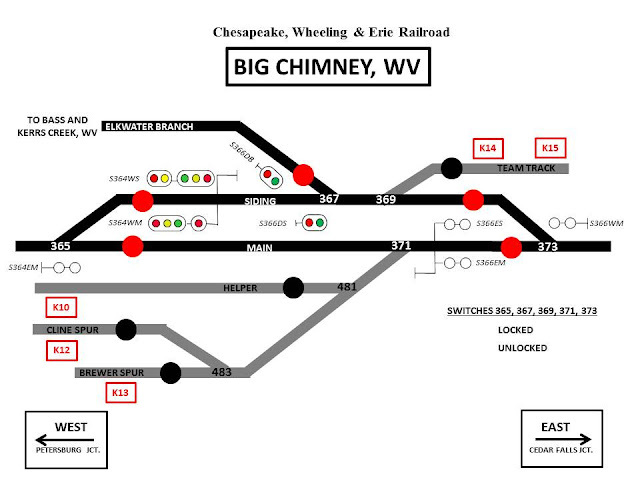 An article by Bob Rivard in the July 2014 edition of Model Railroad Hobbyist (http://mrhpub.com/2014-07-jul/land/#94) provided the inspiration to correct this problem. I had purchased two of the ExactRail Gunderson 50 foot double door boxcars which were decorated for the Frisco. However, a little research revealed that the Frisco never owned these cars. I set them aside with the plan to strip them and paint them for the home road some day. Then Bob Rivard's article appeared in MRH. I have long been a big fan of Bob's modeling and, in particular, his freight car modeling. He has written many articles over the years and they have always been a source of inspiration for me. 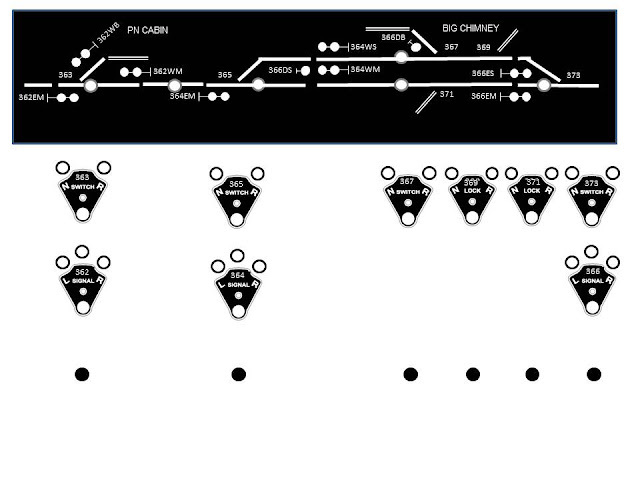 So armed with his article and the two SLSF boxcars, I got to work. First up is BN 318572. Basically, I just followed all of the instructions in Bob's article on this one. The only difference is that I drew the weld seams directly onto the car with a number 2 pencil versus first drawing them on clear decal paper and then applying the decals. Next up is SP&S 319179. I struggled a bit with the doors on this one as I couldn't find any Superior doors that didn't have cast-on tack boards. The door on the left side doesn't have them so I either had to try and remove them from a couple of doors or scratch build them. I chose the latter route and used Evergreen styrene strips to make the doors. I also painted the yellow band on the left hand door versus using Micro Scale trim film as Bob did on his model. The photo below shows the car after I painted the yellow band. There are several places where I need to touch up the green paint prior to weathering the car. 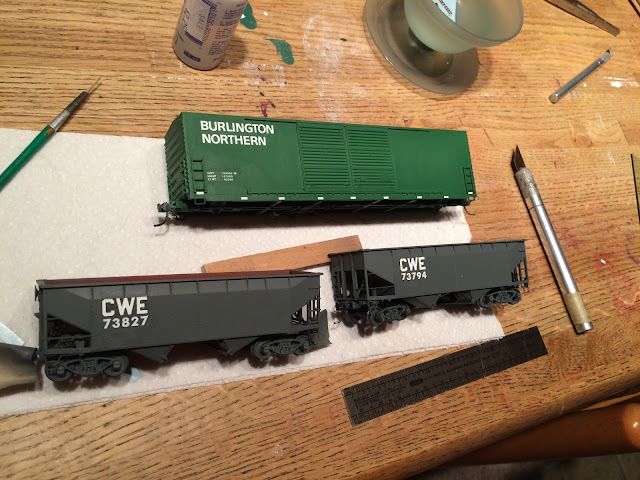 And to round out this first group of western road cars, I picked up couple of the new BLMA Models ATSF Bx-166 double door 60' boxcars. These cars are absolutely beautiful- the detail and prototypical accuracy is just amazing. These cars were new in July of 1974 so I weathered them lightly to reflect how they might have looked after several years of service. The bottom of the car and the trucks were sprayed with Rust-Oleum camouflage brown.Then the entire car was sprayed with a highly diluted coat of Vallejo Model Air aged white. After the aged white had dried, I applied a light coat of Dullcote. Next, I applied a thin wash of artist's acrylic ivory black mixed with a small amount of burnt umber. This wash helps bring out the details. The trucks and wheels were weathered using gouache and weathering powders. The BN and SP&S cars are the first two boxcar projects in a long while where I took the time to carve off ladders, change the doors, etc. in order to model a specific prototype. This has long been one of my favorite parts of the hobby and it was a lot of fun working on these two cars. And now that all of John Miller's freight cars are stored away in boxes, I have to add cars to my fleet the old fashioned way- by actually building them myself rather than "borrowing" them from John.